Virtually every child loves to go horse riding, but this is a sport that requires a few basic skills – and some spare cash – for everything to run smoothly. Many people take up horse riding when they’re very young – either English or Western – intending to become semi-professional in the sport, or to take part in various competitions. That can be expensive, involving the cost of a horse and its care, equipment and lessons. But horse riding is a sport that can be enjoyed simply in itself as well, either through taking a few lessons or engaging in horse riding day trips, private rides or camps. The expense will depend on how much you want to shell out, as you can pay for a one-off experience or a series of lessons. The choice is up to you! The earlier a child starts to ride a horse, the more natural horse riding will be for them. Younger children are usually – although not always – not afraid of horses, which is a good start. While you want your child to have a good time, naturally, your overriding concern should concern safety aspects, and that includes checking out the facility beforehand, as well as teaching your child a few basics about respect for horses, and how to act around horses. Children should only ride with a properly fitted helmet – preferably a new one – and the instructors should be experienced and insured. Only visit a reputable riding school. Age is usually paramount when it comes to horse riding skills, so older children will learn the basics of horse riding much more quickly than smaller ones, and will therefore progress quicker. Children who are confident will also learn quicker than those who aren’t, and will enjoy horse riding more. Some kids prefer to start on ponies and then work their way up, to increase their confidence level at the same time. Dressage. This is a series of movements that make up a specific routine, from very basic to advanced, depending on the level of the rider. Show Jumping. A course event featuring a series of various jumps which differ in height, shape etc. Three-Day Eventing. This will test a rider’s skill and ability in many different areas, including technique and stamina. 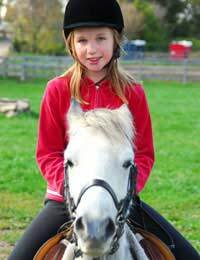 While most instructors stipulate that children are at least seven years old before starting a riding programme, private rides are available for even very small children, accompanied by parents. Make sure you fully investigate the facility before you begin, as not everyone with a horse or two is really equipped to teach horse riding. There should be a variety of lessons offered, the horses should look healthy and bright, and the lesson area should be well cordoned off. Ask around to get a good recommendation from other parents, as word of mouth is usually the best way to find a safe and fun horse riding school. And make sure the teacher is not only well organised and easy to get along with, but also is one who emphasises safety. You might also want to check if the stables are approved by the British Horse Society or Association of British Riding Schools, make sure their tack is up to standard, and bring your own properly fitted helmets. Have fun!